The U3661 operates not only on 100/200 VAC power but also on +10 to +16 VDC external power or on the battery pack Synthesizing of a local oscillator enables measuring the transmission characteristics (ACP, OBW) of narrow-band radio communication facilities. The sideband noise, -105 dBc/Hz or less, achieves the best performance in its class, enabling high-accuracy measurements even in field use. 50 µs High-speed Sweep Function In Zero Span mode (fixed tuning mode without frequency sweep), the sweep time can be set up to 50 µs. 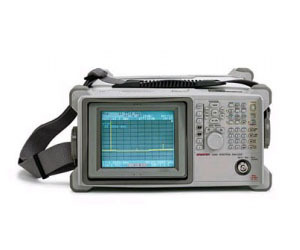 This makes it possible to observe TDMA waveforms for GSM, PDC and PHS, and to perform detailed analysis through magnified display of rising and falling burst waveforms.